The greatest of ideas are borne out of necessity and Cortech saw a need for a dual purpose glove built to withstand abuse. 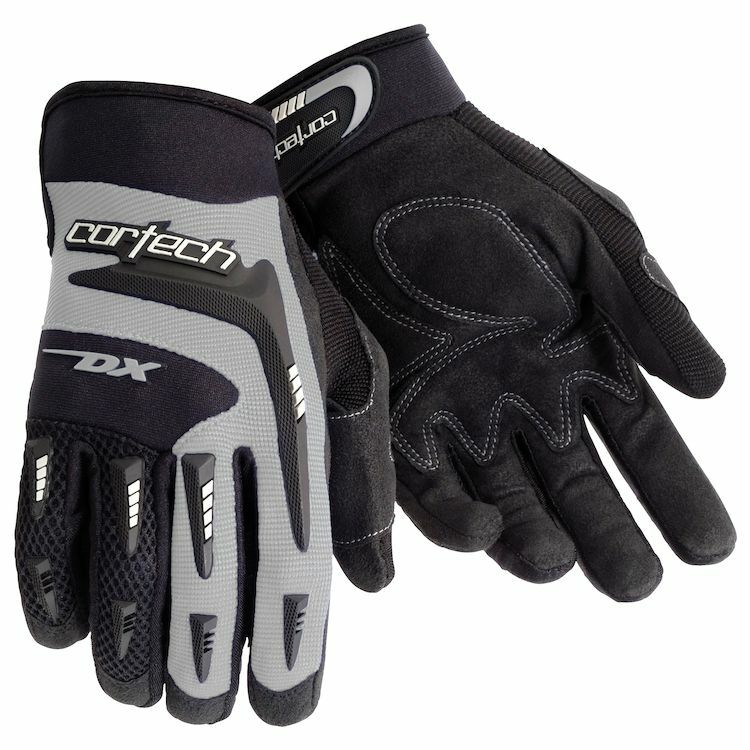 The Cortech DX 2 Gloves retains all the elements of the DX gloves from years past and continues on the tradition of a well-built but lightweight glove for adventure riding. Good grip, comfortable, and breaths really well for those hot and humid summer days. Once the temps get into the 50s you'll want something with a bit more warmth. Beginner glove. Taking my course this month and needed some riding gear. Good reviews and good value in a summer glove. Colors to match the jacket. Good glove for warm weather riding. Provide reasonable protection, but one should not expect much if your hands hit the pavement at speed. usually last about a season, but at this price, it is worth the comfort in summer heat. The most comfortable warm weather glove I've found for long distance riding. Looks like a nice entry level glove that offers some level of protection for a good price. Need a spare pair of gloves for upcoming trip and the reviews were good and fit what I'm looking for. Good price and great look. My brother had a pair and purchased a new pair recently. I also liked the style. Last September in southern Colorado I borrowed a pair of these for a 5 day adventure ride on KTM 690's. The temps were cool, but sometimes we were sweating due to hard riding, yet the gloves felt great the entire time. One night up on Red Mountain pass my hands did get very cold because I had no electric grips, but these gloves are not designed for that low of temperatures. I liked them so much that I am ordering a pair for myself today. Sounds good for light weight, good tactile gloves with some protection. Inexpensive & previous satisfaction with other products from the Cortech brand. Not only cheap but looks like it provides the right protection in the right areas. Needed an inexpensive but good quality set of lighter gloves for short runs on the bike. Loved the pair I just wore out. Best summer gloves I hav found. My son requested these gloves! I have used DX2 (previously DX) gloves for years. They can't be beat for comfort and price. I didn't realize that Cortech is still making these gloves. Because I have an excellent references about this motorcycle clothing. I live in Florida and need mostly simple gloves that are apropos for warm weather but offer a little protection and coverage. These seem to fit the bill nicely. I needed new gloves. I've been happy with the Cortech gloves I've purchased in the past. Was looking for a lightweight summer glove for commuting. I've had good look with Cortech products in the past and these were at a great price. Affordable, well venting summer gloves! Looks to be good basic glove for fair price. Reviews were good. At least should do for a spare if not quite up to everyday use when I get it. The basic protection at a good price. Wound up using for work and they survived well. I chose these gloves to get through my MSF basic course I'll be taking at the end of the month. I will (per availability) eventually purchase the Scorpion SGS gloves as my main pair and use these as backup. Overall they look like decent comfortable gloves and I've heard good enough things to have these as back ups for hot summer days. Replacing a pair I've worn hundreds, maybe thousands, of times over the last 2 or 3 years. They finally wore out and I saw no reason to get anything else. They are comfortable, light, easy to put on and take off and fit "like a glove" duh. Can't think of anything to complain about, and that's unusual. I had a pair for a few years, time to get a new pair cause the old ones are worn out. Highly recommended. I needed some lightweight gloves. These seemed to fill the bill. I have heated grips so don't need anything really heavy.